Originally commissioned by millionaire W.K. D’Arcy, “The Round Table” tapestry is officially known as The Knights of the Round Table Summoned to the Quest by a Strange Damsel. 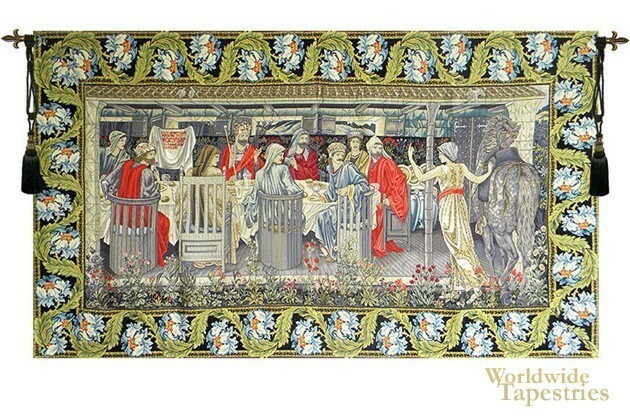 It is the first in a series of six tapestry panels illustrating The Holy Grail that was produced by the famed Morris & Co. just before the turn of the 20th Century. The original of this particular tapestry was designed by Edward Burne-Jones in 1895-96 and is an excellent example of the artistry of the Arts & Crafts Movement. One of the originals of this tapestry hangs at the Birmingham Museums & Art Gallery in England. Our version is true to the original in color, texture and weaves. The tapestry is lined and has a tunnel for easy hanging. Note: tapestry rod and tassels, where pictured, are purchased separately. Dimensions: W 55" x H 31"